Passenger Information is the delivering of real-time information to people who are planning their travel, waiting for an arriving vehicle or already onboard. Accurate and reliable passenger information is critical to increasing mass transport ridership and has a positive economic effect on a city by reducing lost productivity and personal time. 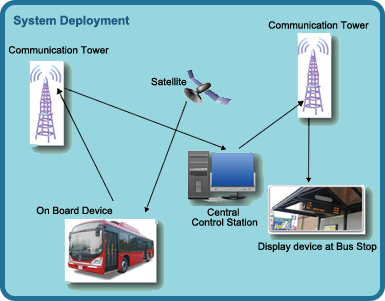 SXnavo provides real-time passenger information via the internet (using computers or smart phones) and mobile phones which allows people to access the predicted arrival time of the transit vehicle at their stop. This information is also provided via displays at public places and bus stops. These displays can also provide information about service, weather or other matters of public interest. Open data interfaces allow this information to be mixed with a storeowner's display or other systems. 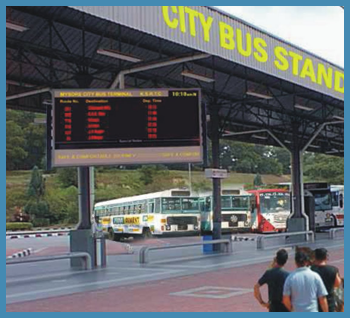 SXnavo also delivers this real-time information to passengers onboard the vehicle to advise them of upcoming stops using audible announcements and lighted signs inside the bus. Audible announcements outside the bus also inform waiting passengers when the bus arrives at a stop. This information improves accessibility for people with disabilities, while providing important enroute information for all riders, especially commuters or tourists who may not be familiar with the local bus transport system.